← Little Bighorn: A Novel by John Hough Jr.
No witches, vampires, or science fiction action. But with a tile like Last in a Long Line of Rebels, how could I not want to read it??? Louise Mayhew, Lou, is the daughter of a junkman. Oh sure, it might sound glamours but not everyone thinks so. When Lou tells Sally Martin that she is going to have a better summer than her, Lou frantically starts to panic. Nothing exciting happens at the junkyard that is her backyard. She is desperate. She does something drastic, she prays for an exciting summer. But she gets more than she bargains for when she discovers that her Civil War-era house is about to be condemned. She’s determined to save it, but the only way to do that is to uncover the secrets of the past. I love the underlying theme of our history has an impact of who were are not only as a society but as a person. I like how ‘race’ was dealt with in this book. At times, I was frustrated that it didn’t do ‘more’ with the race issue, it’s a little bit fluffy but then I had to remind myself that this is a book for a ten year old. With that it mind, I think that this is a great book to start a ‘race’ conversation with a middle schooler. But there is more to Last in a Long Line of Rebels than just race. There is a murder in the pass, as well as some gold stealing. The vibrant characters were a riot. That being said, parts of this were very SLOW. I think with some editing this could be a very exciting book. Overall, a nice debut. Last in a Long Line of Rebels comes out tomorrow, September 29, 2015. 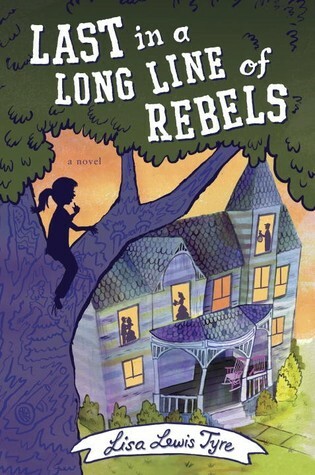 This entry was posted in Middle Grade and tagged Historical, Last in a Long Line of Rebels, Lisa Lewis Tyre, Middle grade reader. Bookmark the permalink.